Sophie has been practising yoga since 1992. She became a certified Iyengar yoga teacher in 2006 and has worked with the Iyengar family in Pune several times since then. 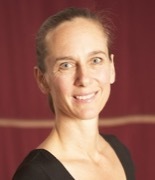 She is a student of Peter Thompson, a Senior Iyengar Yoga teacher, and participates in on going development with him. She has a passion for this practice. She loves quiet time alone and finds the discipline of daily practice brings passion and joy. She has a love of her early morning sitting and pranayama practice. Sophie loves the idea of taking the length and perspective of the body ‘on the mat’ to effect change. Then taking this practice ‘off the mat’ into relationships with others and the world. Her teaching inspires others to pause and breathe and become less reactive to the world. Sophie is also teaching and practicing Ayurvedic treatments at her studio in Elwood.